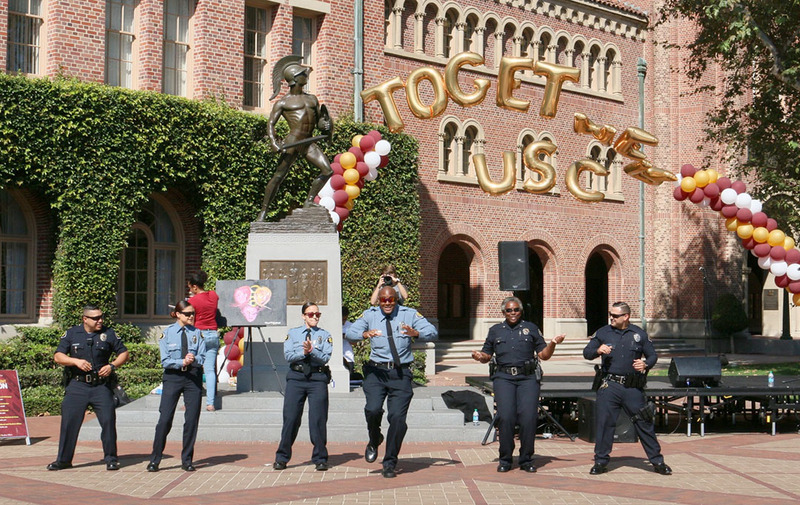 Spectators cheered as several Department of Public Safety officers — as well as students and faculty members — broke out in dance to the “Cha-Cha Slide” and the “Cupid Shuffle” in front of Tommy Trojan. The dance, which was meant to represent unity between the student groups and staff, took place on Tuesday as part of #TogetherUSC, a campaign designed to promote diversity and raise awareness for the inclusion of different student groups on campus. 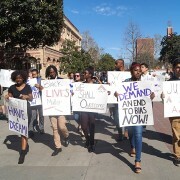 The hour-long event was sponsored by the USC Division of Student Affairs Support and Advocacy. The event began with a performance by the Troy Tones, one of the student a capella groups on campus, followed by a flash mob. 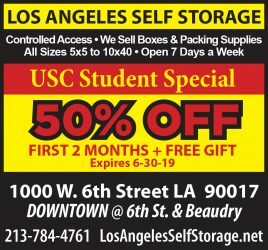 Throughout the event, faculty and staff in the Support and Advocacy division of Student Affairs passed around candy and slips of paper with contact information for various resource centers on campus. In her opening remarks, Lynette Merriman, the assistant vice provost for Student Affairs, Support and Advocacy, urged students to reach out to their peers. 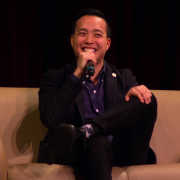 Merriman also emphasized the importance of awareness for stereotypes or stigmas on campus in efforts to minimize and eventually eliminate them. The event included live painting from Sarah Reyes, a junior majoring in public relations. 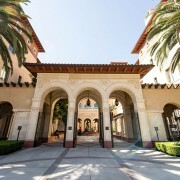 Taking inspiration from the event, Reyes stood in front of Tommy Trojan at the beginning of the event with a blank canvas that she slowly transformed into a colorful painting, illustrating three different faces all intertwined with each other. The piece will be on display at the Office of Student Affairs. 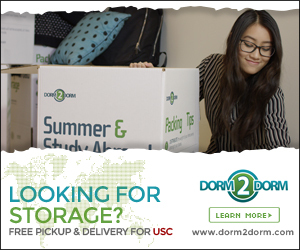 Represented departments at #TogetherUSC included Asian Pacific American Student Services, Bias Assessment Response and Support Team, Center for Black Cultural and Student Affairs, Relationship and Sexual Violence Prevention Services, Disability Services and Programs, El Centro Chicano, LGBT Resource Center, Student Judicial Affairs and Community Standards, Student Support and Advocacy and Trojans Care 4 Trojans.